The Good Ship Toontanic – day 14698. | NUFC Blog. 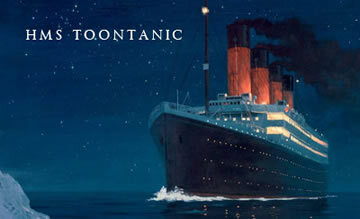 The Good Ship Toontanic – day 14698. Each day I seem to grow more weary yet I hang onto my hope. We are still deep rooted in the doldrums, without fuel nor wind we can not move, Captain Shearer is full of hope for what might be, but he too wrestles with his imaptience to get things started. We just need a little fuel to get going – he awaits like an expectant father for the fuel to arrive. However there is still no sign of the new fuel arriving, the passengers and crew are awaitng nervously, we dont yet know what fate has in store for us, yet we all grab at every whisper of optimism that it will be here soon, one more day thats all…. Master Harris set off alone yesterday, he went overboard in a life raft, he is intending to row to the Persian Gulf, he hopes to find new investment to bring the Toontanic to her former glory. Its a difficult thing to achieve in these times, folks are a skeptical bunch especially of repairing ailing aged and mismanaged ships whose income is dwarfed by her outgoings. I expect Captain Shearer will order many of his crew to be thrown overboard – they are too greedy and take to much of what the Toontanic generates to be allowed to stay. Younger – fitter less greedy crew will arrive soon I hope…..I will head to my cabin, to see another day out listening to the creaking and groaning of the expectant hull……. NUFCBlog Author: Stardust	Stardust has written 15 articles on this blog. this is my witty alternative to writing ‘1st post’ for the Toontanic diaries. I’m just waiting for the awful sound of the collision. IS ANYONE ALIVE OUT THERE?!?!?!? !